You can bundle up nicely. Diversity is one of the wonderful things about the city of cyclists. i wish i could ride me bike. Cycling in wellies is a brilliant idea - no oil marks on your jeans! The second shoot is wearing red hunters, i love it! I prefer the second one, cover up nicely with a pair of red hunters. Great ! 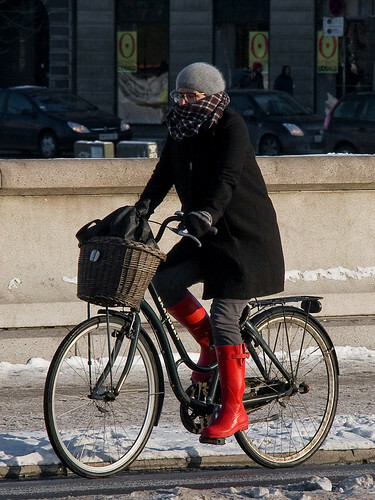 It's great to see such a city of cyclists, like here in York, northern England - also quite cold ! This should be to emulate. I want to do in my place. The bike must be one of the greatest ever inventions. Your images are a delight ! Oooooooo! I want me some knee high red wellies. AGM: The loom, the fore-aft sail and the bicycle; inventions don't come much greater than these. i'd say the keel outscores the fore-aft sail. plus it's a viking invention so that's nice. Mikael, are you sure that wouldn't be more properly phrased, "The keel is a Viking invention, which is nice, so I'd say it outscores the fore-aft sail"? Of course my having Levantine ancestors has NOTHING to do with my opinion on the matter. Townmouse: Check out Target. They have the red ones; and purple, tartan, paisley, leopard . . . - how come the women get all the good stuff? You can't go wrong with big red boots! (second picture) click those heels together three times I wonder where you go! (viz. Wizard of Oz). Townmouse (2): I had you in my mind as NEW English, not the Olde kind. Nevermind. The info can still be applied by any of the other Yanks out there looking for posh rubber boots; although they're Chinese knock offs, not Hunter. love that red rainboots with bike! 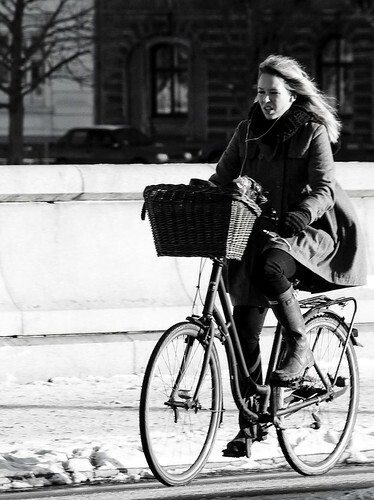 I like all bicycle pics around this www--copenhagencyclechic--com, I also like the way the photographer taking all the pics. 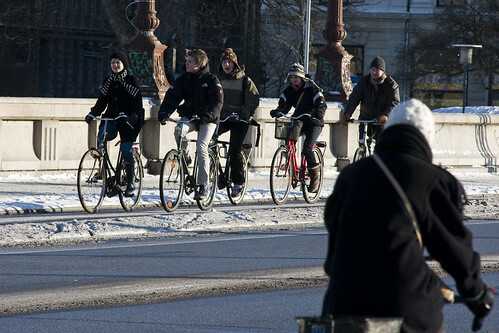 Look at all bicycle riders...,their expression snapped accurately by the photographer...I like! Welcome to my website : http://9wallpapers.blogspot.com. This is a website where have a lot of beautiful wallpapers . Especially , all free !!!! @kfg - I can get real hunters here, it's just that having paid an arm and a leg for a pair of wellies, I'll end up with one welly too many. And if that isn't the last line of a limerick, I don't know what is. Townmouse, you wouldn't have an extra welly, you'd have a place to put the extra glove. And OK, I'll bite; is that the last line of a limerick?